Oddly based on that pic it seems the pallets don't want to catch fire. Not sure if the paint is fire resistant. [zb] me, I hope its not one of ours! rambo19 wrote: [zb] me, I hope its not one of ours! Was that a Merc ? Hear they have a habit of spontaneously combusting . beefy4605 wrote: Was that a Merc ? Hear they have a habit of spontaneously combusting . So, at last, proof positive there is a benevolent god! Hard to tell but the headlight and panel round it look MAN to me. Non-Flammable: - Wooden Pallets stacked 16' high. trevHCS wrote: Oddly based on that pic it seems the pallets don't want to catch fire. Not sure if the paint is fire resistant. The pallets are soaking wet and the trailer has a headboard which is acting (for now) as a heat shield by preventing the pallets from reaching their combustion temperature. It's just what you need on a Friday!! Err... I was allowing for the clean-up time. 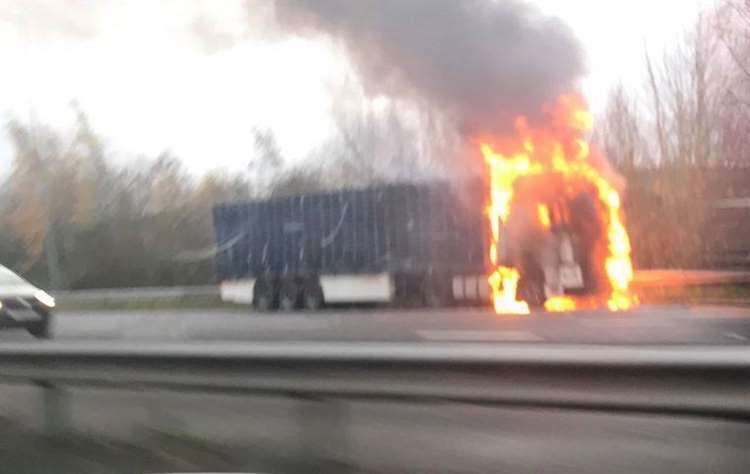 There's been a lot of lorry fires on that buckmore park stretch of the M2 though. It must be the strain of going up the hill... with all those wooden pallets weighing you down..